I love weddings, they’re such joyous occasions. Full of memories with family and friends celebrating new beginnings. I find that especially true when it’s someone you’re close to, like my cousin’s wedding last month. It was an absolutely perfect day, she was the most beautiful bride and I felt so honoured that our family was able to be a part of it. My mother and I grew and arranged flowers for the big day, along with help from our family. 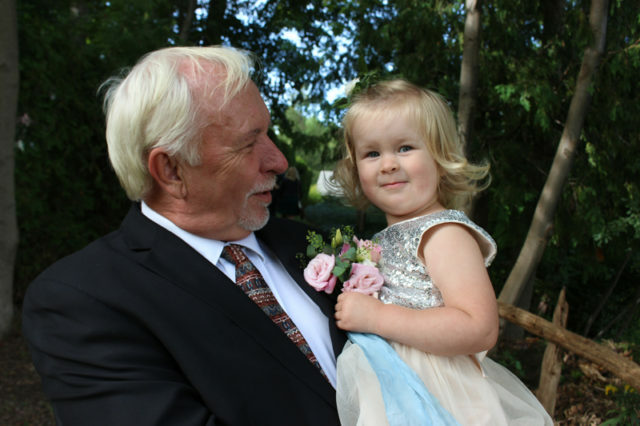 Our little Lucy made her wedding debut as the flower girl, which is why you’ll see so many pictures of her below, ha! 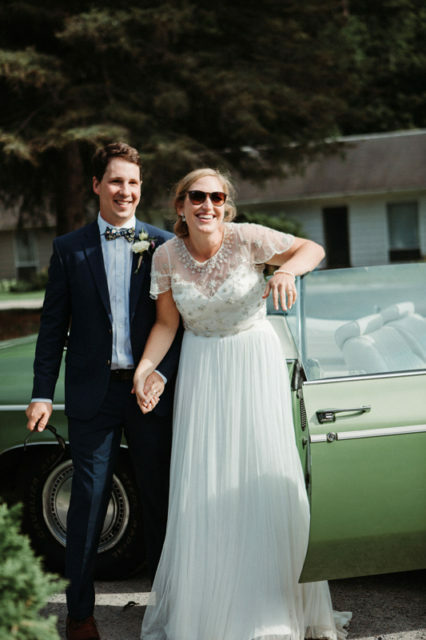 Some of these gorgeous pictures are from their photographer, Arden Wray. She was really able to capture the day and I love seeing our Cloverhill Flowers in action. This arbour was made by my uncle earlier this summer, using cedar railway ties from my great aunt’s old farmhouse. 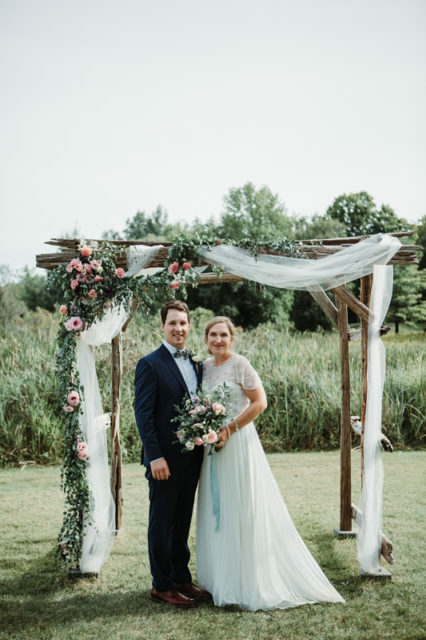 On the morning of the wedding, my sister and my brother’s girlfriend helped me drape it in ivory tulle, then attach a eucalyptus garland they’d made the night before and add in pink lisianthus flowers – both of which we grew in the flower field behind my farmhouse. 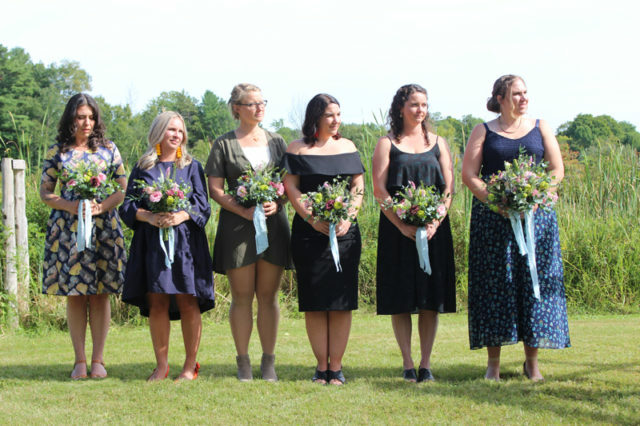 The bouquets featured soft pastel blooms, including lisianthus, pink flamingo celosia, Queen Anne’s lace and eucalyptus. The bride and her wedding party got ready at my aunt and uncle’s beautiful lakeside cottage before the happy couple did their “first look” down by the water. It feels like just yesterday we were little kids jumping off this dock and now to think she’s all grown up! The hair piece was a fun little touch that we created to match her bouquet and nestled perfectly on top of her stunning coif, with pearl pins throughout. 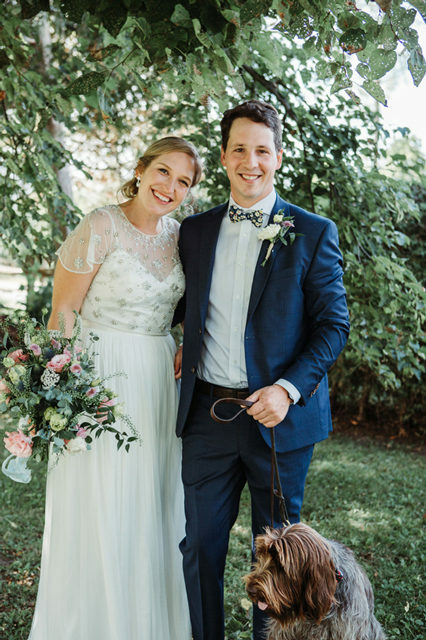 The lovely couple with their adorable dog Wilbur! (you can see a cute picture of Lucy and Wilbur at their first Christmas here). 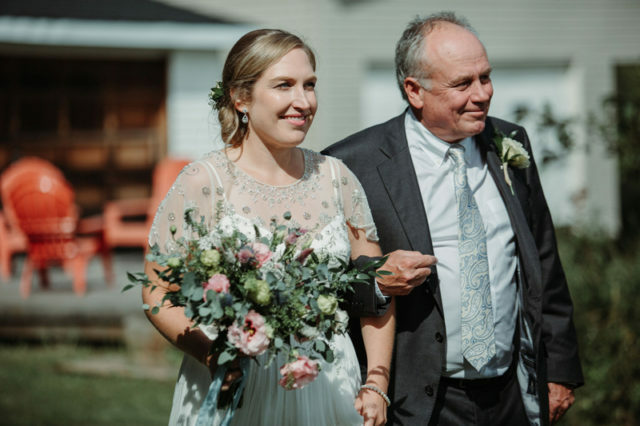 The bride’s dress was absolutely stunning, with a pleated skirt, silk camisole and intricate bead work on the top (all from BHLDN by Anthropologie), and I loved the groom’s floral bow tie. 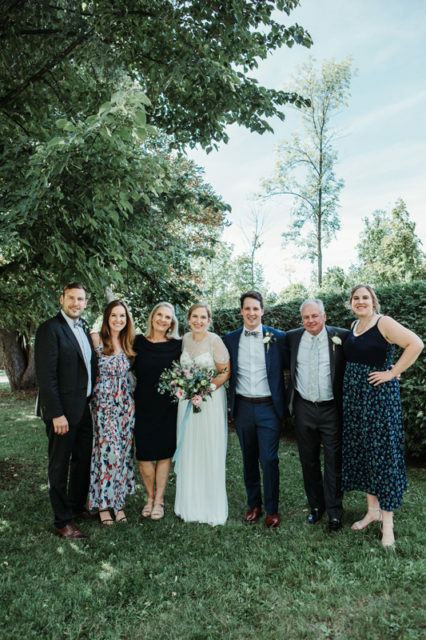 It was such a special day for my aunt and uncle too, getting to celebrate their daughter and new son-in-law while surrounded by family and friends. 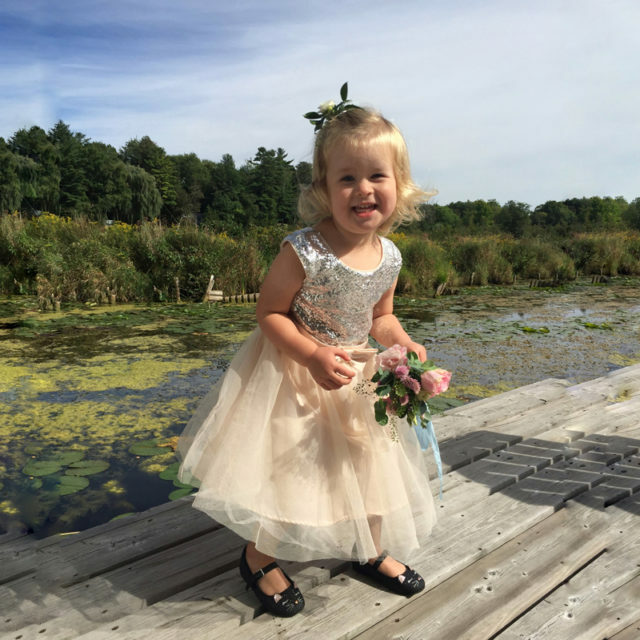 Our little farm girl Lucy happily traded in her rubber boots for a flower girl dress and sparkly black cat flats. She kept telling us that it was her “Cinderella dress”. 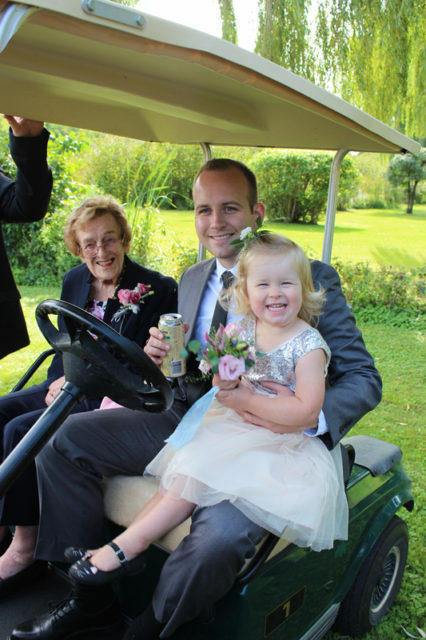 We knew that her walking down the aisle may be a game time decision and my cousin was really great about saying there was no pressure if she didn’t want to do it at the last minute. You never know with a two year old! Thankfully she was quite happy to do her duty and walked down the lawn with me. 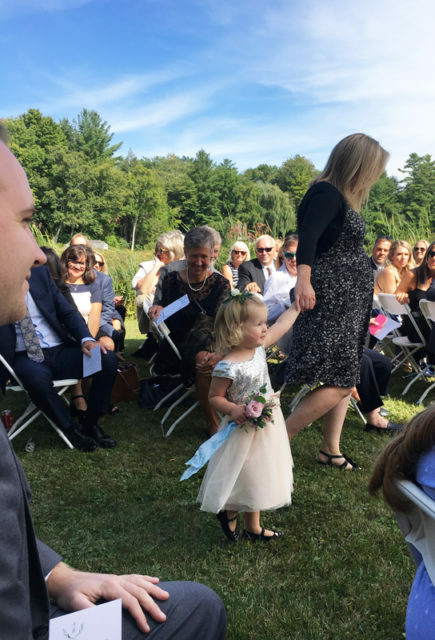 Then when I tried to convince her to continue down the aisle to Garrett at the front without me, she grabbed my hand even tighter and inevitably I had to tag along, ha! I couldn’t help but get weepy when I saw my cousin walk down the aisle with my uncle. It brought back so many memories of my dad doing the same thing on my wedding day. 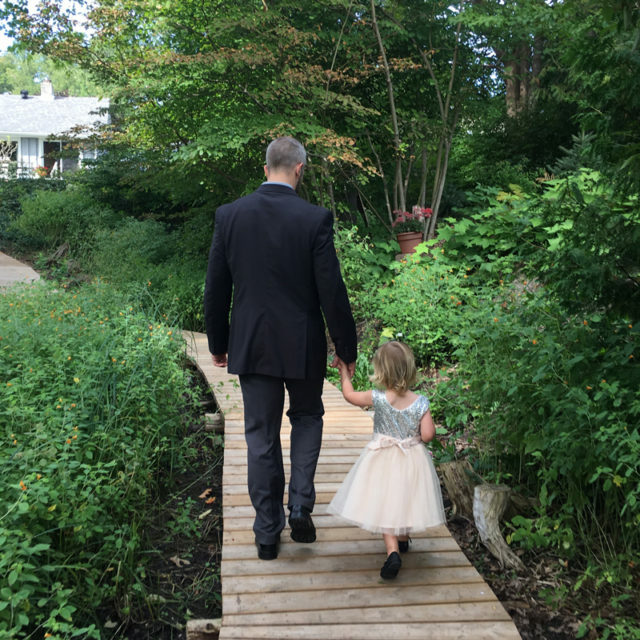 You should have seen me when they did their father-daughter dance – full tears, folks, full tears. 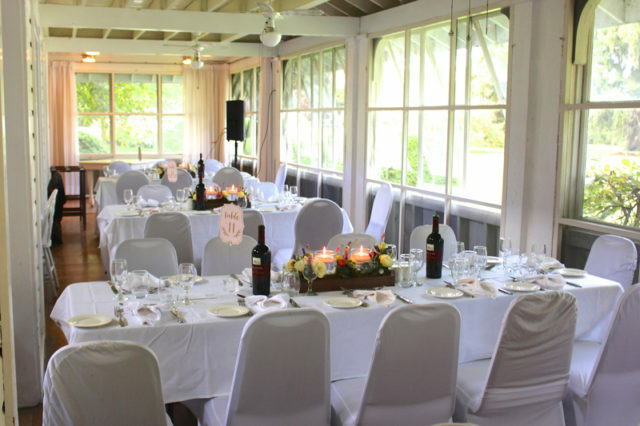 The ceremony was performed by a friend of the family at a beautiful property along the river that leads to the lake. 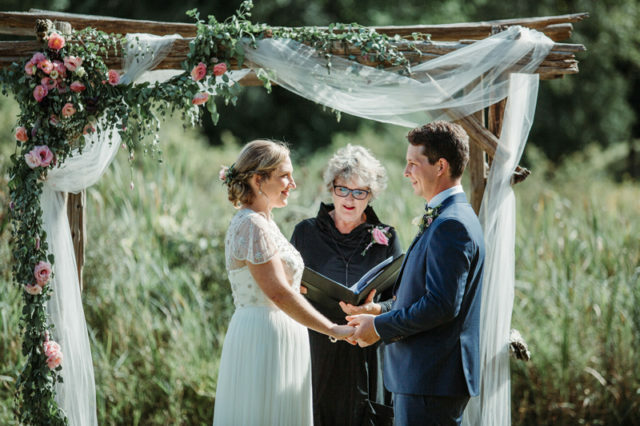 Family and friends were gathered on the lawn, watching these two say their vows in the warm September afternoon sun. The bridesmaids all looked lovely and carried the bouquets we made them. An extra touch was the light blue hand dyed silk ribbons we’d had made by a local artist. It brought out the blues in the thistle and eucalyptus. 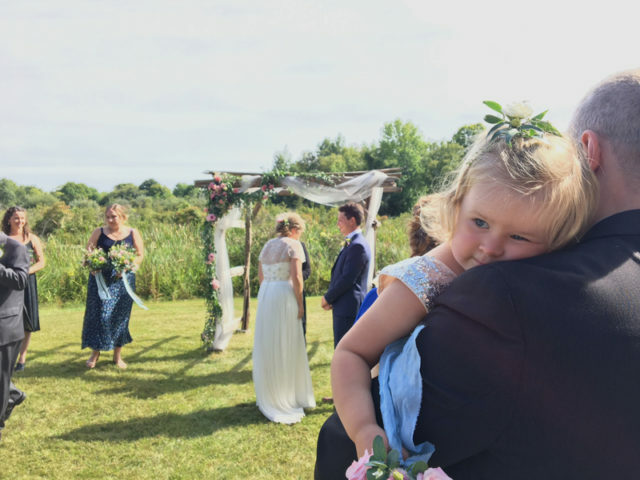 I just love this shot my cousin’s girlfriend got of Lucy on Garrett’s shoulder during the ceremony. 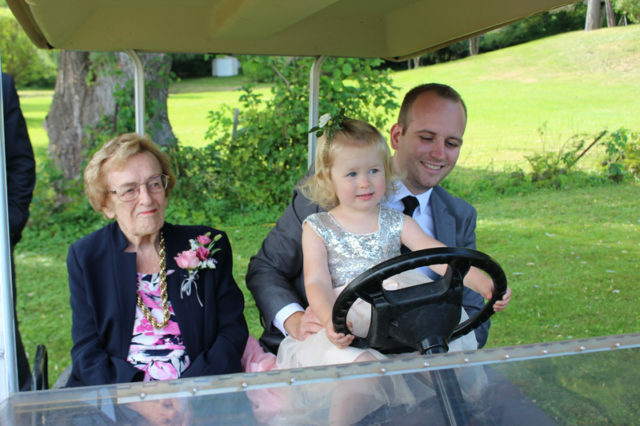 After the ceremony she was quite happy to hop on my brother’s lap and try to convince him to let her drive my great aunt in the golf cart up to the venue. I can see we need to be worried once this one get’s her driver’s license. I mean, come on, how sweet is that? I’m keeping these for when he walks her down the aisle for her own wedding someday. 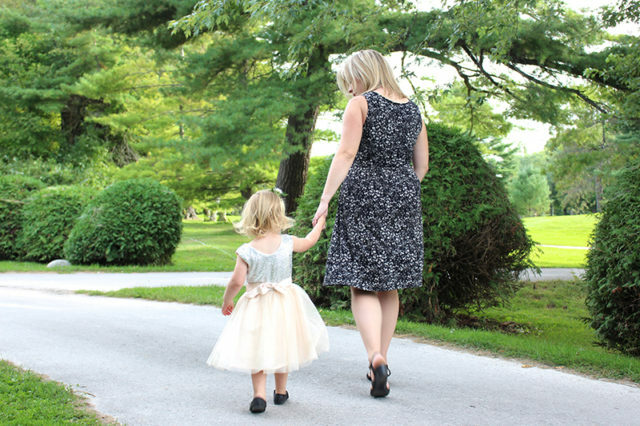 For a two year old, she was really well behaved – which kind of shocked me at first because I thought all the strangers and excitement would throw her off. Boy, was I wrong. 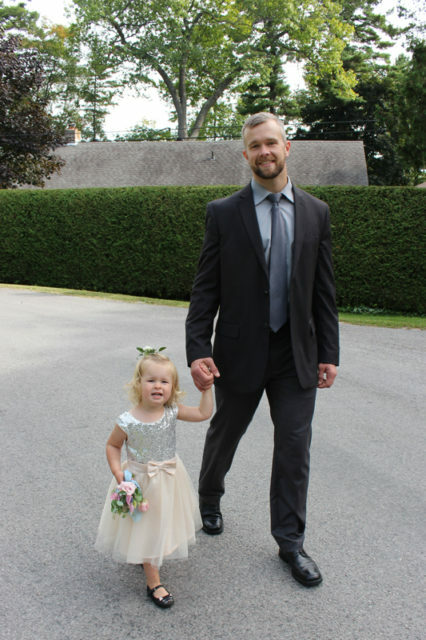 She relished in her role as flower girl and happily followed us around the wedding, twirling in her skirt and flirting with her fellow guests. Lucy made the rounds at cocktail hour, visiting family and friends (and hanging out with my dad, her Poppa). Garrett’s parents kindly picked her up before the dinner began and she had her first official sleepover at their house. It was so nice for Garrett and I to have a night out to ourselves, especially with the baby on the way so soon. Who knows when we’ll get that again! 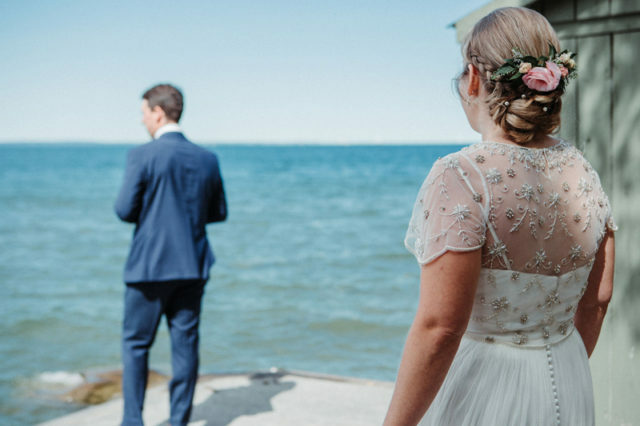 The reception was held in an iconic local lake house that lends itself perfectly to a late summer wedding. 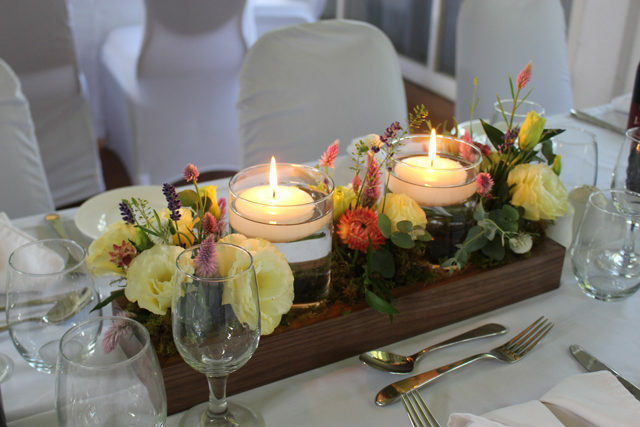 For the centrepieces, the groom built us these stunning wooden boxes that my mother and I filled with our homegrown flowers nestled in moss between floating candles. 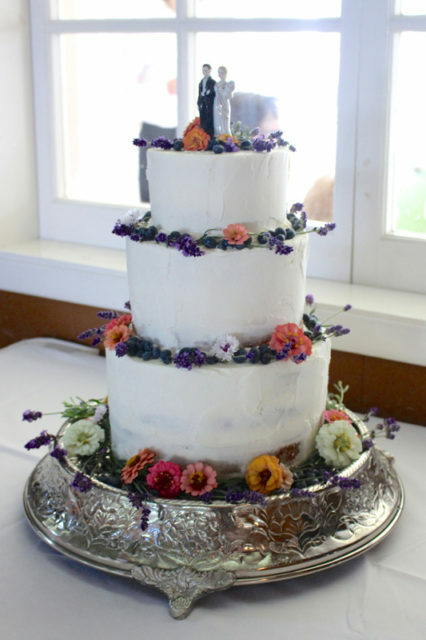 We were going for a wildflower look, using smaller blooms and lots of little sprigs of lavender and greenery. We don’t normally do wedding work in our flower business, so it was so much fun getting to be creative with our blooms and make something we hoped would be memorable for the happy couple. 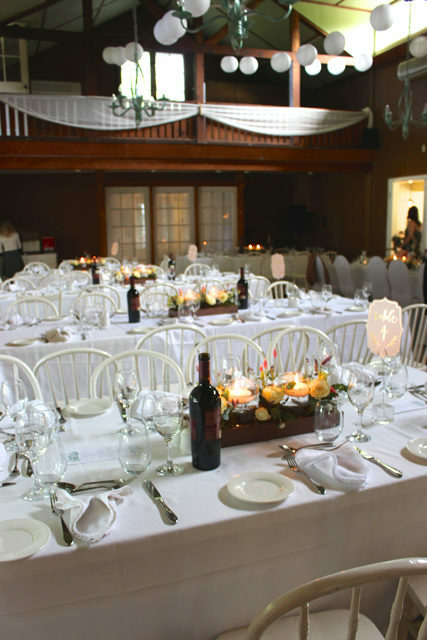 The bouquets (bride’s on the left and bridesmaids on the right) were used during the ceremony and then were put into vases throughout the venue as decor for the rest of the night. 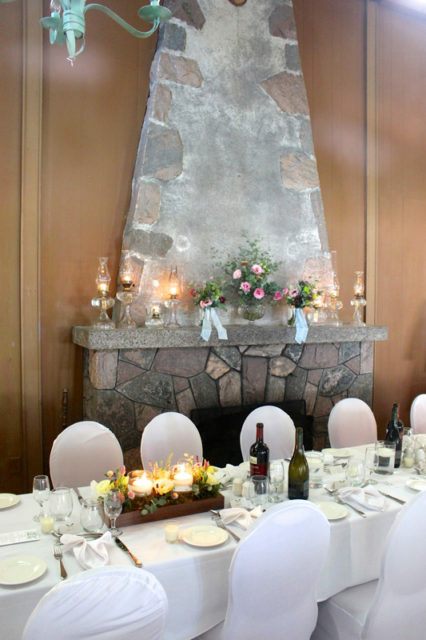 Two of the bridesmaid’s bouquets were on the mantle on either side of a large rose bowl vase that was the bride’s late grandmother’s. We loaded it with eucalyptus and flowers. 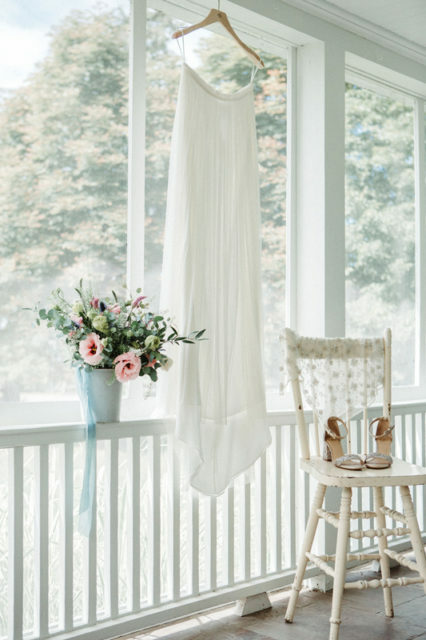 You can see that same vase on the table at the bridal shower we hosted for her this spring as well. For the cake, the bride had a local bakery make a naked cake (gluten free for the groom!) and we added some of our edible flowers – zinnias, bachelor buttons and lavender. 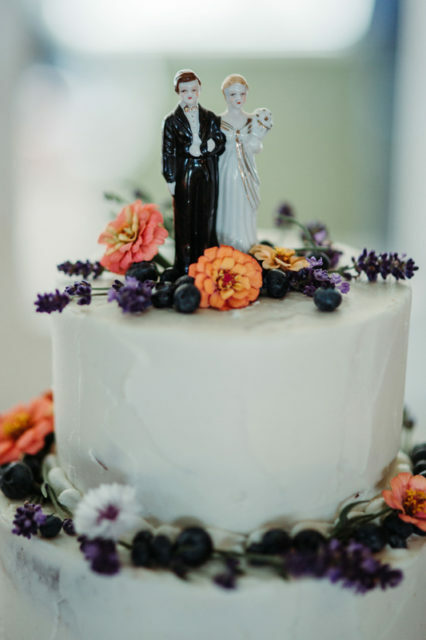 She used our family’s favourite cake topper – it’s from my great aunt’s wedding, then my parents, my wedding cake and now my cousin’s too. This sweet little couple has held up well for the last 60+ years! 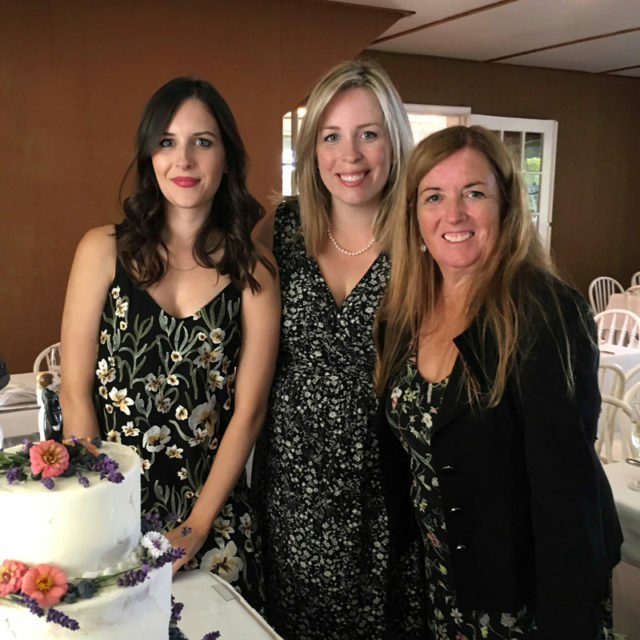 My sister, mom and I decorated the cake together and thankfully someone got a picture of us doing it because it’s the only picture I have of us from the whole day, aside from some fun goofy pics we took in the photobooth, ha! 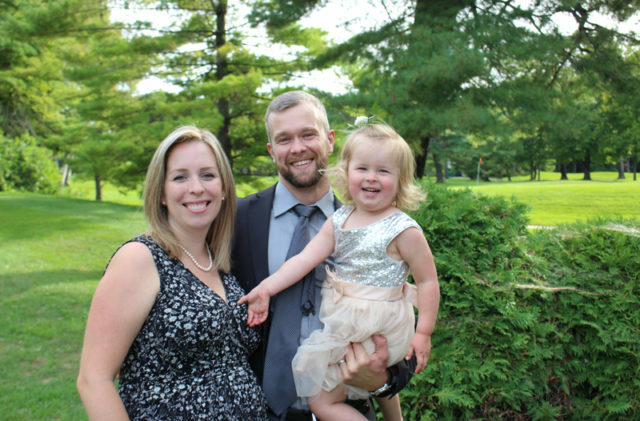 And a rare picture of the three of us (four if you count the baby bump!) all dressed up. You can really see how much Lucy looks like Garrett here and I love it.